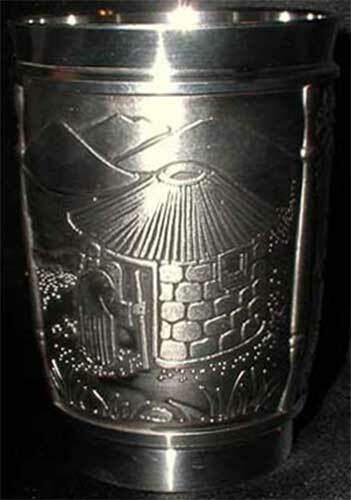 This Irish whiskey glass from Mullingar Pewter features a card with the Salmon of Knowledge legend. The Fianna of old were commanded by a man named Fionn Mac Cumhail. It was said that he held a secret power, was a brilliant poet and musician and could look accurately into the future. The power to prophecy great events was uttered only when he touched his thumb to his teeth which was very odd. The name given Fionn at birth was Demna but he became Fionn because he was fair haired. The magic power to see into the future and be a great commander came about this way. When Fionn was a young lad he went to the Boyne Valley near Slane and gave everyone he met his birth name which was Demna. He choose Slane because of his interest in learning poetry and music on the harp. Happily he met an aged poet who fished all day alone on the river Boyne. He befriended Demna and in return Demna ran errands and helped at the cooking pit. The man’s name was also Fionn but Demna said nothing about being a namesake. The old poet nursed a secret. He heard the prophecy, which told him that the run of salmon would include one which would be the fated Salmon of Knowledge. To catch it amongst the millions of salmon in the river would be an arduous task. To catch the salmon would make one the recipient of the world’s treasure of all knowledge that man or woman would ever need in their lifetime. To taste that salmon brings knowledge and knowledge brings power. Being named Fionn as decreed by the prophecy the poet would acquire great powers in the field of influence which he could use for the good of mankind. Now, while the learned poet really like Demna he did not tell him his secret. He wanted to be even in old age, the most learned, best informed and far-seeing person in the land. So wonder of wonders the poet caught the Salmon of Knowledge in his net. He brought it home. Before he lay down to rest his tired-worn body he gave the fish to Demna to prepare and cook. The poet spoke sternly saying “Demna, take charge of this fish while it cooks. I alone must be the first to eat it. Whatever you do, do not taste it or eat it” and Demna agreed. Demna was an honorable lad and, of course he would do as his friend asked. The cooking was carefully watched over by Demna. When a blister formed on the silvery skin Demna instinctively touched it with his right thumb and burst it. In doing so he burned the tip of his thumb on which grew a painful blister. To ease the pain he put his thumb in his mouth. Soon the fish cooked. He called his friend to supper and placed it in front of him. The poet smiled gleefully. Already a learned man he would soon become the most knowledgeable person in the land. The poet enquired of Demna if he had kept his promise and not tasted the salmon. Demna explained how he burnt his thumb while bursting a blister on the skin of the salmon and placed it in his mouth to ease the pain. The poet was enraged and jumped from the table. His only chance of acquiring endless knowledge had now passed. He told Demna that only a person named Fionn could taste the Salmon of Knowledge and named him Fionn at that very moment. “It’s you Demna, now Fionn, who shall acquire knowledge, the power of foresight, and become the great leader of a great people. So Fionn Mac Cumhail (Pronounced Finn Mac Cool) returned to the Fianna and grew in strength of character, knowledge and all manner of superior skills in sport, music and military command. Fionn choose not always to use his great powers. Why? Because whenever he did so he got a sore thumb. 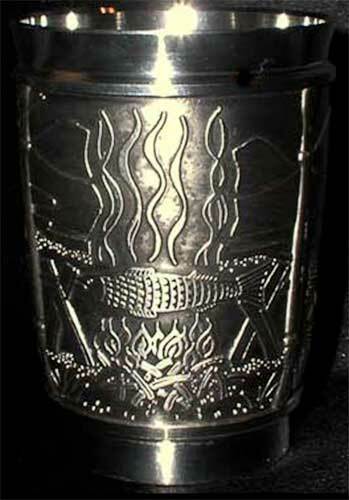 This pewter whiskey glass features the Irish legend of Finn Mac Cool and the Salmon of Knowledge depicted on three embossed panels. 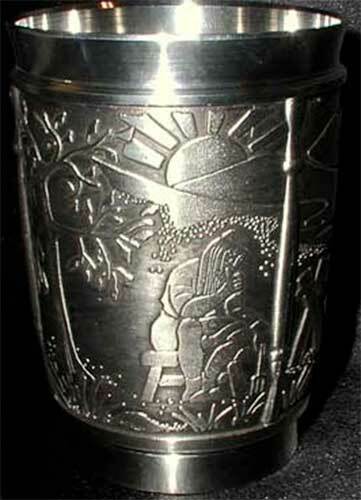 The Irish whiskey glass is a lowball or double old fashioned size that measures 3" wide at the rim and stands 4" tall; the 10 ounce glass is made of lead free pewter. The Irish legend whiskey glass is made in Ireland by Mullingar Pewter and it is gift boxed with the Salmon of Knowledge legend, complements of The Irish Gift House.